I also tried with Sitecore client interface to load log file, but even there, i didn't get any log file. Any thoughts or idea, where I can find it or is it something we need to setup? Accessing Sitecore XP logs and diagnostics information on Azure Web Apps differs from the on-premise approach. This article explains how to collect basic Sitecore diagnostics information, such as logs and configuration data, for a Sitecore XP solution deployed to Azure Web Apps. Go to Azure Portal (https://portal.azure.com). Select the specific Application Insights object related to Sitecore XP deployment. CloudRole — a name of a cloud role. Each scaled-out instance is associated with several cloud roles containing their own logs. After logs are retrieved, they can by exported to a CSV file. For more details about writing custom queries, use the analytics query reference from Microsoft Azure documentation. 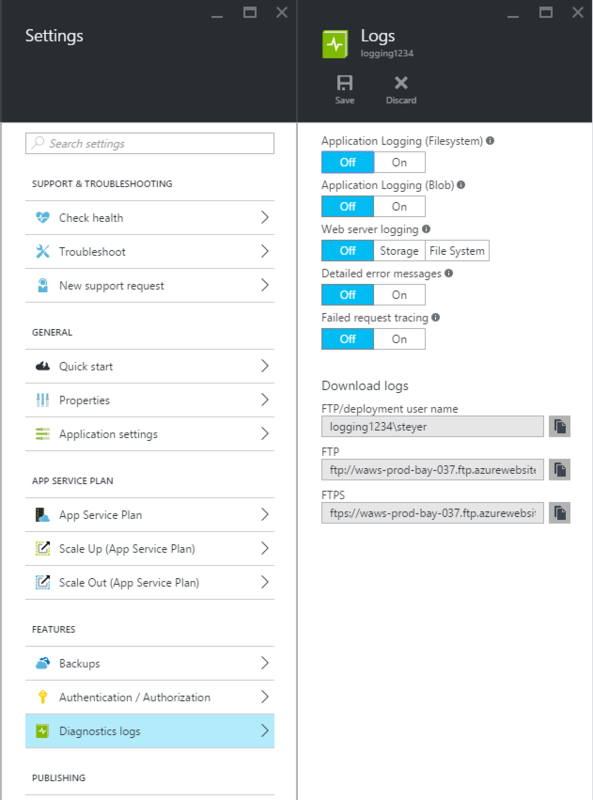 Update Is possible to Enable logstream on Azure app service. Not the answer you're looking for? Browse other questions tagged azure logging paas or ask your own question.